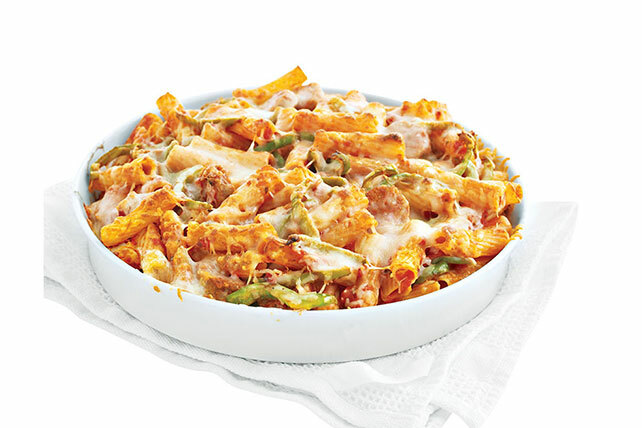 Combine pizza toppings and pasta in our Sicilian Sausage & Peppers Baked Rigatoni. This spin on baked rigatoni is smart and totally satisfying. Place sausage and peppers in 13x9-inch baking dish sprayed with cooking spray. Bake 15 to 20 min. or until sausage is done. Meanwhile, cook pasta as directed on package, omitting salt. Drain pasta. Add to baking dish along with the pasta sauce; stir. Bake 15 to 20 min. or until heated through. Top with cheese; bake 2 to 3 min. or until melted. Substitute 2 cups zucchini chunks for the sliced green peppers.